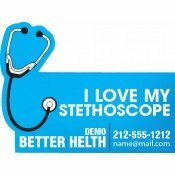 Stethoscope refrigerator magnets are surely an asset to a healthcare marketing campaign due to its apt shape. 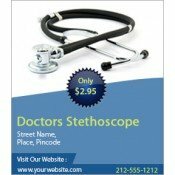 Stethoscope is a popular symbol of health and everyone can relate to them easily. 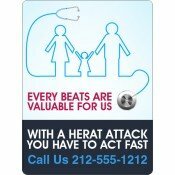 Doctors, healthcare centers, clinics, mobile dispensaries and individual health care professionals can easily rely on these advertising magnets to promote their services and increase their credibility. We can ship these highly in demand promotional magnets free anywhere within the contiguous USA. In US and other parts of the globe, it is becoming difficult to live a day without news about certain healthcare crisis. This is why healthcare marketing is becoming a challenging thing because industrial credibility is sinking faster than the Titanic. Nowadays, physicians have to work hard to build a loyal customer base. Perhaps there are several hundred of practitioners within 100 sq. km offering the same kind of service. This is why healthcare practitioners are seeking unusual ways to build their credibility and positioning their business. On analyzing marketing trends, it can be seen that physicians have been largely using business cards, calendars, postcards and brochures to approach their clients. The main problem with these promotional materials is instability and reliability. People may easily misplace them or stash them somewhere which means a loss of business opportunity. 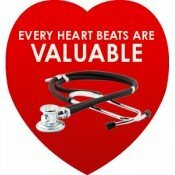 It is these stethoscope fridge magnets that can make a difference. Offered in various sizes and customized shapes, these stethoscope fridge magnets are very appealing. People can easily identify a stethoscope because it is a very important acoustic medical device used by doctors for preliminary detention. 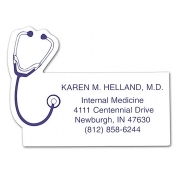 A stethoscope magnet lends added promotional advantage to doctors because people will easily stick them on their refrigerator doors because health is a wealth. During emergencies, people do not want to waste time fiddling through their mobile phones or searching through doctor’s visiting cards. It is easier for them to go near their refrigerator door and see the contact details of their favorite practitioner. 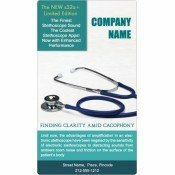 These personalized healthcare magnets combine the practicality of a business card and elegance of a sophisticated promotional gift. 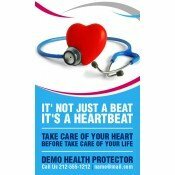 Perfect for regular in-hospital giveaway or these personalized magnets can be offered through associated pharmacies, clinics, hospitals or during tradeshows, medical camps, etc. Avail free shipping, free art setup, free online design proof and free full color printing on all these promotional fridge magnets. To know more about special pricing and freebies, feel free to approach us at 855-762-4638 or write to us at info@cmagnets.com.